Windows Admin Center is the modern evolution of "in-box" management tools, like Server Manager and MMC. It complements System Center - it's not a replacement. 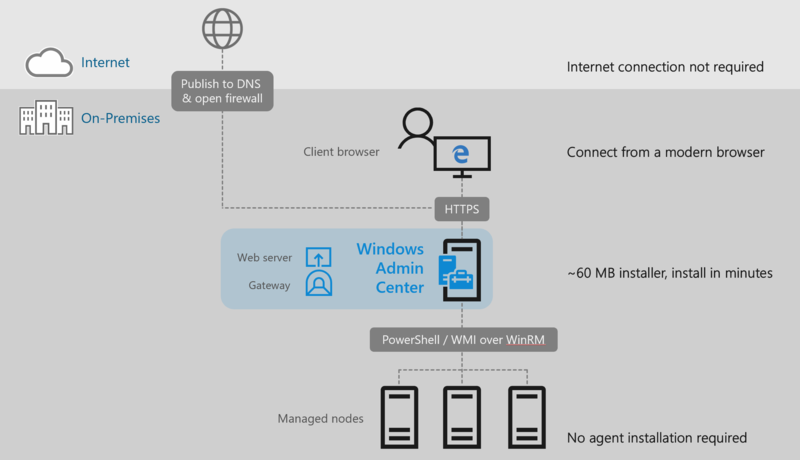 How does Windows Admin Center work? Windows Admin Center runs in a web browser and manages Windows Server 2019, Windows Server 2016, Windows Server 2012 R2, Windows Server 2012, Windows Server 2008 R2, Windows 10, and more through the Windows Admin Center gateway installed on Windows Server or Windows 10. The gateway manages servers by using Remote PowerShell and WMI over WinRM. The gateway is included with Windows Admin Center in a single lightweight .msi package that you can download. Windows Admin Center is the evolution of long-standing, well known management platforms like Microsoft Management Console (MMC), built from the ground up for the way systems are built and managed today. Windows Admin Center contains many of the familiar tools you currently use to manage Windows Servers and clients. Install on a Windows 10 computer, and start managing in minutes, or install on a Windows 2016 server acting as a gateway to enable your entire organization to manage computers from their web browser. 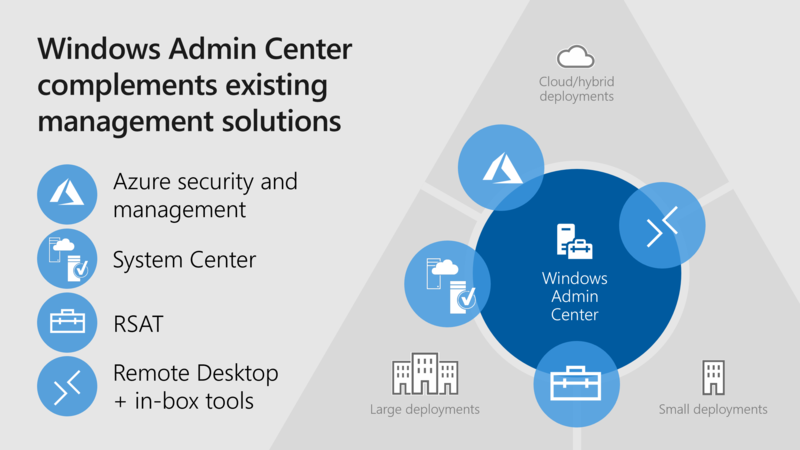 Windows Admin Center works with solutions like System Center and Azure management and security, adding to their capabilities to perform detailed, single-machine management tasks. Publish your Windows Admin Center gateway server to the public Internet, then you can connect to and manage servers your from anywhere, all in a secure manner. Windows Admin Center has many enhancements that make your management platform more secure. Role-based access control lets you fine-tune which administrators have access to which management features. Gateway authentication options include local groups, local domain-based Active Directory, and cloud-based Azure Active Directory. Also, gain insight into management actions performed in your environment. Windows Admin Center has many points of integration with Azure services, including Azure Active Directory, Azure Backup, Azure Site Recovery, and more. Windows Admin Center offers the best experience for managing hyper-converged clusters - including virtualized compute, storage, and networking components. Windows Admin Center was built with extensibility in mind from the beginning, with the ability for Microsoft and 3rd party developers to build tools and solutions beyond the current offerings. Microsoft offers an SDK that enables developers to build their own tools for Windows Admin Center.